ONE. Washing your hair everyday- Since I have stopped doing this, I have probably noticed the biggest difference in my hair over any other serum or mask I do. Washing kills. I have extremely oily hair and I’ve found the perfect timeline that works for me, but everyone is different. Try and find your happy medium. Image from The Hair Styler. I wish I could go longer without washing–agreed! I can do every other day. I have itchy scalp and I figured out if I wash more often, it’s less itchy. I had itchy scalp too but since I have grown my hair longer I pushed myself to leave washing it for longer, ponytails are great for this. After a few weeks I noticed no more itch and I can go 4 or 5 days between wash. I think you just need to give your scalp time to ‘normalise’. Try a vinegar rinse, it soothes the scalp (the same way it helps heal sunburn) 2 tbs vinegar to a cup of cold water. 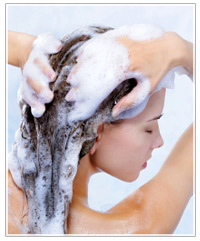 Rinse after conditioning and the cold water will also help seal your hair- make it shiny! Once your hair dries, I promise it wont smell like vinegar. If it does, make sure to rinse your hair with more water before ending your shower. I used to think that not washing my hair everyday was going to make matters worse, but once I tried Washing it every three days and changing my shampoo, I notice the difference in a a little over a week. I live in a super arid climate and HAVE to use leave in conditioner. It makes such a big difference in frizz and static reduction. Also, there are many other reasons your scalp could itch besides washing it too much, if it doesn’t get better after a couple weeks, i would try an anti itch shampoo that keeps working even after you rinse. Thanks for the great, informative post!! 🙂 I’m doing all of the above (yay!) and started doing that about a year ago. I wash my hair every 3 days and my hair is happier and shinier now. I also don’t use shampoo (or any other product!) because of the chemicals in it. I use Moroccan Rhassoul Clay which works wonderns both for hair and skin If I need a conditioner, I spray it with Apple Cider Vinegar and rinse it out. In between washes I use corn starch when my hair gets a little greasy. I’m blonde so the corn starch doesn’t show. I heard brunettes can use cocoa powder!? I have to shower every other day or else my hair becomes an oily mess! I don’t use conditioner because I’ve noticed it makes my hair more oily, have any tips for that? Thanks!! When using conditioner dont put it on your scalp. Start at the hair even with your neck and go down. That way your hair can still get the soft benefits of the conditioner but it won’t weigh it down. Using a baby powder or corn starch helps remove some of the excess grease and you should brush your hair from the root down to spread the oil into your tips. Also don’t not use conditioner at but use a little less of it and apple cider vinegar is a great clarifyer and moisturizer for your hair ad scalp it helps remove the extra stuf your hair doesn’t need and leaves it soft and shiny. But the more you start letting your hair get greasy the longer it will eventually take to need to be washed. I only wash my hair once a week now. Maybe, instead of conditioning all of your hair, avoid applying it to the roots, i.e. only apply to the length of hair – I don’t know if that makes sense but basically only from the nape of the neck beyond. What can really help your hair is to just shampoo the top half of your hair and then condition the rest of your hair. If you condition the top of your head it will get really greasy looking. I do this all the time and I go about 2-3 days without washing it. Totally agree with washing hair less often! I wash my hair every 4th day – my hair gets to the bottom of my rib cage so it’s just so much easier and cheaper to wash it less frequently. However I also have a problem with my hair becoming oily if I don’t wash it every two days so to solve that, I rinse my hair on the second day of not being washed. These are also the days that I condition my hair. Something else I’ve noticed since I started washing my hair this way, is that I have a lot less hair falling out. P.S. I’m only 19 years old so for any young adults/teens out there reading this and thinking “OMG that’s gross!! !” or whatever, just give it a try for about 2 months or so before deciding that it’s ridiculous – it take about a week or two for your hair to adjust to the less frequent washing regime. I have fine, thin hair and I can go about two days without washing it. I was wondering if there was anything I could do help grow my hair out faster and thicken up my hair also!! I need a little body! so on the days that yours NOT washing your hair…do you still wet it in the shower or just toss it in a bun and try to keep it dry? Get yourself a shower cap! They’re cheap, they look dumb but they’re funny, and they work. I shampoo twice and condition once. Shampoo, rinse, shampoo, rinse, a nickel size amount of conditioner (my hair goes to the back of my knees) and pin it up in a clip and leave in for about 3-5 minutes. Rinse really well. Yes apply only to the “ends” from the nape of the neck on. I am so with you on the vitamins. Also, sleep and water. Water water water water water! Nothing is truly better than that. Considering hair and nails are made of dead skin cells, consider what nourishes fe skin from the inside out. The dermis really will not absorb much from the outside in. Protein is more important for their hair and nails than a lot of people realize, keeps your circulation primo, and helps make nails super strong; the same thing goes for skin (and mood regulation…) except times a BILLION for Vitamin D. The one I’ve done the most research on would be prenatal vitamins, which every female on birth control should be taking anyway. B Vitamins are important and also fish oil. I have tried so many hair remedies. I just cannot go a day without washing my hair. I also have fine hair and oily skin/scalp. My hair just grows SUPER slow. I mean at a snails pace. I’m definitely going to try and condition less and when I do condition the length only. I had never thought of that. Dry shampoos just don’t work for my scalp. I’m taking prenatals which has done wonders for my nails. I could probably drink more water. I have also heard massaging your scalp for five minutes helps to stimulate the hair follicle. I’m just not sure how to go without washing my hair on a daily basis! Would love to be able to do this. Be careful when using dry shampoos as they have a tendency to remove hair from the cuticle. Thanks for your post! I have read before that you shouldn’t wash your hair daily, and I have tried to cut down (I have naturally oily pores, so I’ve tried to shoot for every other day). However, I work out everyday, and my hair gets sweaty and gross. Do you have suggestions for post workout hair care that doesn’t involve a wash? PLEASE GET YOUR HAIR TRIMMED EVERY SIX MONTHS. The ends of your hair become EXTREMELY dry and break off, causing it to SEEM like your hair isn’t growing. If you think about it, your hair grows from .5in to 1.5in every month, so if you get 1in off every six months, it’s like nothing! Seriously, it’s better to get it trimmed regularly than to have to cut off even more than you thought. Your split ends will split up your hair farther and farther and will break off more and more. I cannot stress this enough. Trimming your hair is one of the things that causes the BIGGEST change to hair growth. Why have hair down to your bum if more than half of it is dry and crispy? Hi.. I live in a super super humid weather condition.. Which makes it necessary to wash my hair everyday from sweating and other pollution… And I have noticed it that if I go a day without washing my hair I’ll suffer from excessive hairfall… Over and above my already hairfall trouble… I need help… I am going crazy about my hairfall and want to know what can be done about this..
Great question, have you tried dry shampoo at all? It absorbs the oil and impurities in your hair so that you don’t have to wash your hair every day. I think this could help you! Even if it let you go every other day, I think you would benefit from that. Here are a few products I like. If your hair is falling out excessively, I can totally relate to this! I have had a few babies and sooo much hair falls out afterwards. I use a hair promoting vitamin (anything high in biotin, really) and that seems to speed up the re-growth. Nioxin is supposed to also help with hair falling out.